admin – SONS OF THE SOIL : ABERDEEN FREEMASONS HALL : MASONIC TEMPLE ABERDEEN : ABERDEEN MASONIC LODGES. Welcome to the official website for Sons of the Soil; number 1451 on the role of the Grand Lodge of Scotland. We warmly welcome all suitablly qualified brethern to attend our meetings held in the Freemasons Hall, Aberdeen on the first and third Wednesdays each month from September-April each year. All Sons of the Soil visitors new to the Freemasons Hall Aberdeen, will be given full tours of the building either before or after our regular meetings as a token of our appreciation. We are very fortunate to be able to work our own live candiates for these last few years and have many candiates that will either start their masonic journey with us or complete what they started last term. This year 2018 we have around 23 candiates waiting to go through the craft although theres a lot of completed forms still to be read out and the next regular meeting will be on the 5th of Sept 2018 we are working a triple 2nd degree but we are also doing at least 5 C.O.E the same night he says hopefully tyle for 7.30 pm but we might run a bit later! If you have never been to the finest freemason hall in Scotland we would be happy to give you a tour of the building after the evenings labours have been concluded. For Non-Freemason visitors to this website the brethren of Sons of the Soil would be happy to explain what freemasonary is all about. Nothing bad to report this month (july/aug). We now have our own facebook page with over 6000 members updated daily please click this link. 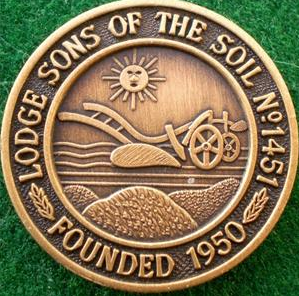 The Lodge was granted its charter on 4 th may 1950 with the name “Sons of the Soil”. As far as can be found out the name came from the farming region of Oldmachar Bridge of Don, Aberdeenshire and was the providence of Aberdeenshire East as most of its members were farmers. There were 46 founder members recorded by the Grand Lodge of Scotland of which two prominment names are “Lord Belhaven of Stenton” and “Sir Charles Malcolm Barclay-Harvey”. At the consecration on the 11th October 1950, 126 Brethren signed the tyle from Lodges throughout the area. The first Master was Bro John Newton Whitehead. The Lodge met at the Corner House Bridge of Don, in an outside building, remaining there until Monday 2nd of December. There are no records until the Lodges next meeting on Wednesday 5th March 1958, which was held in the Masonic Temple, Crown Street, Aberdeen, in the Province of Aberdeen City. Where the Lodge continues to meet to this day. In the year 2000 the Lodge celebrated its 50th Anniversary and was re-dedicated by the RWPGM of Aberdeen City Province, Bro Alex Smith. The RWM of Lodge Sons of the Soil was Bro Bryan Neave. This meeting was held in the upstairs hall at the Masonic Temple, Crown Street, Aberdeen.